entrepreneurs, finance professionals, science and technology enthusiasts, and other business professionals seeking to interact, collaborate, and build a professional networking community in the lower Manhattan area of New York City. The professional networking series sponsored by French brasserie and lounge, Plein Sud-Toro Lounge, and hosted by publicity and promotions company, MUI-The PR Company, will be held inside the Thompson-Smyth Hotel (85 West Broadway, Tribeca, New York, NY) every Friday 4PM-7PM during the months of July and August. The inaugural launch of the networking event on Friday July 13 will contain the following features for pre-registered guests: premium cocktail and food specials, $20 gift certificates to Plein Sud, complimentary desserts designed exclusively for the event by Top Chef Kurt Alexander and, a live performance by new York-based music and poetry band, "The Afroteric Hip-Hop Crew". 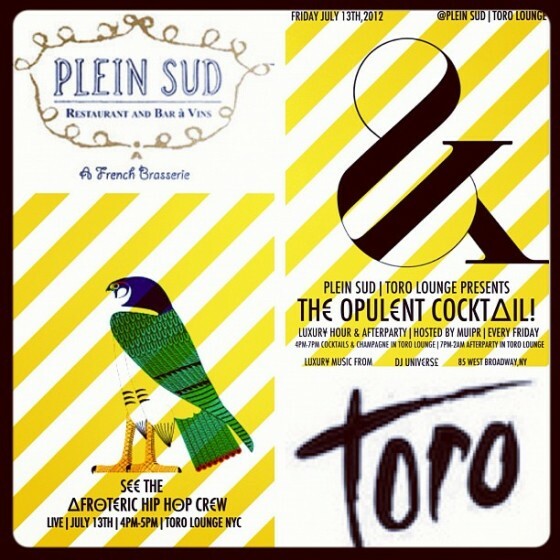 "The Opulent Cocktail Networking Event is perfect fit for Plein Sud-Toro Lounge because it will enable us to showcase our alluring and fashionable space within the context of a social event that caters to business professionals of a high caliber, "said Harry Barksdale," Toro Lounge Manager. "With the combination of an alluring space, optimal location and savvy career-minded professionals, the Opulent Cocktail Networking Event is for individuals looking to build their social capital this summer," said Nicole Nadal, Assistant Publicist, MUI-The PR Company. "I am excited about the tremendous buzz this event has created" said DJ Universe. "Connections brought on by high caliber networking events such as this are important, particuarly for professionals and leaders with an active interest in sharing ideas to support the growth of professional development opportunities in the New York metropolitan area."